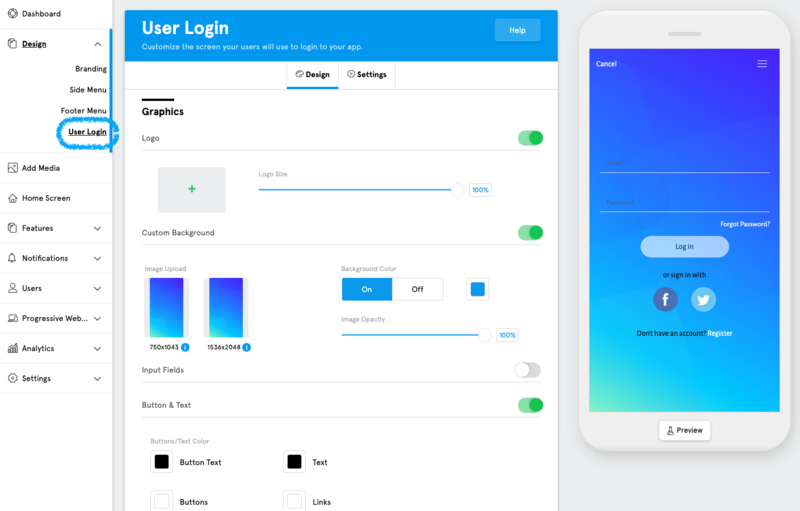 Start adding functionality to your app and edit the design. Welcome back! In the last lesson, you learned about what BuildFire is, a little bit about the App Dashboard, the difference between Core Features and Marketplace Features, and how to preview your app. In this lesson, we’ll take a closer look at the core components of the App Dashboard that you’ll use to both build and manage your app. 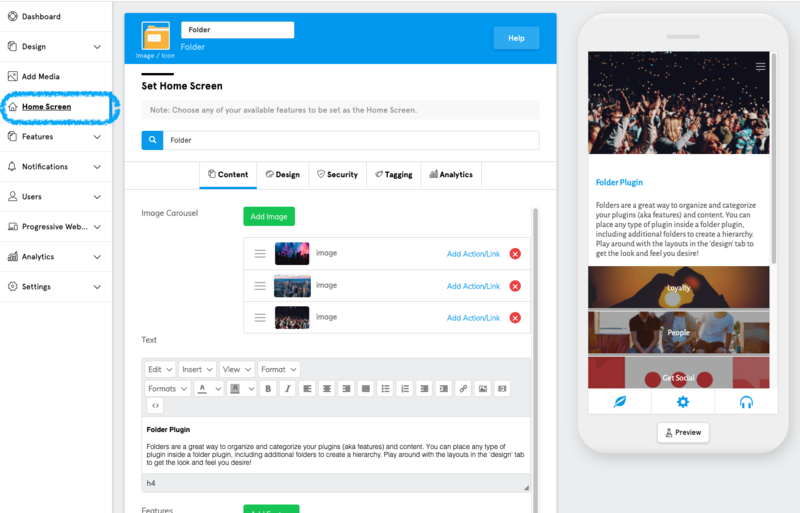 When you first created an account, you either started with a blank app, template, or you had our awesome Pro Services team design and construct your app for you. 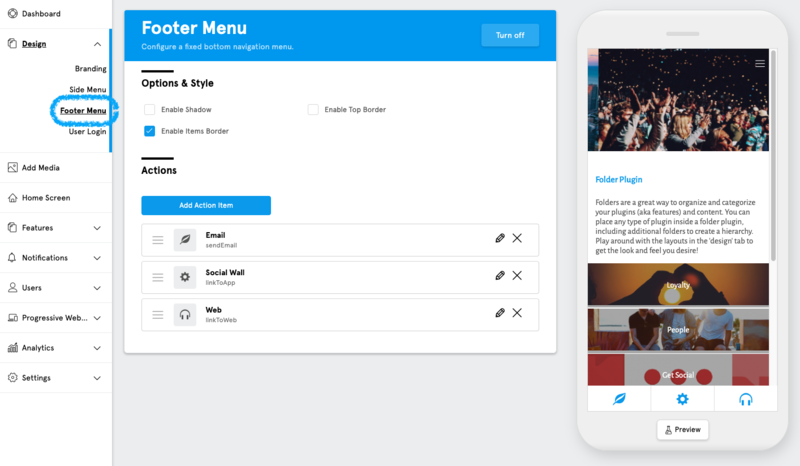 As we mentioned in our last lesson, if you’re building the app yourself, the templates will provide you with an awesome starting point so that you can simply swap out your content and have a ready-to-launch app. 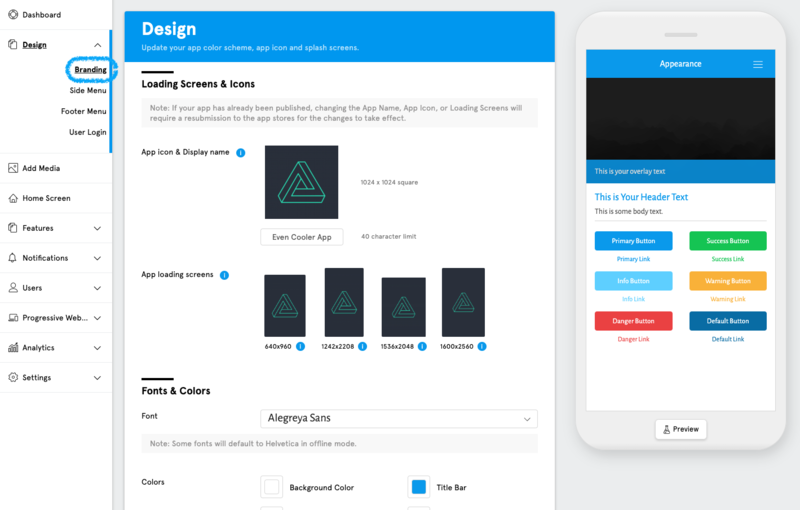 If you’d like our Pro Services team to either design your app or build completely custom features for it, we encourage you to click here to get in touch with them. Next, let’s go over the App Dashboard’s core components so that you can better understand how to use them for the benefit of your app. If you would like to learn more about these components, we have dedicated articles for all of them which you can find here. You can learn more about the Branding Page here. You can learn more about the Side Menu Page here. You can learn more about the Footer Menu Page here. You can learn more about the User Login Page here. High quality images are a critical part of making your app stand out and can help elevate your brand’s perception. The Media Library is an amazing tool that can help you accomplish this. 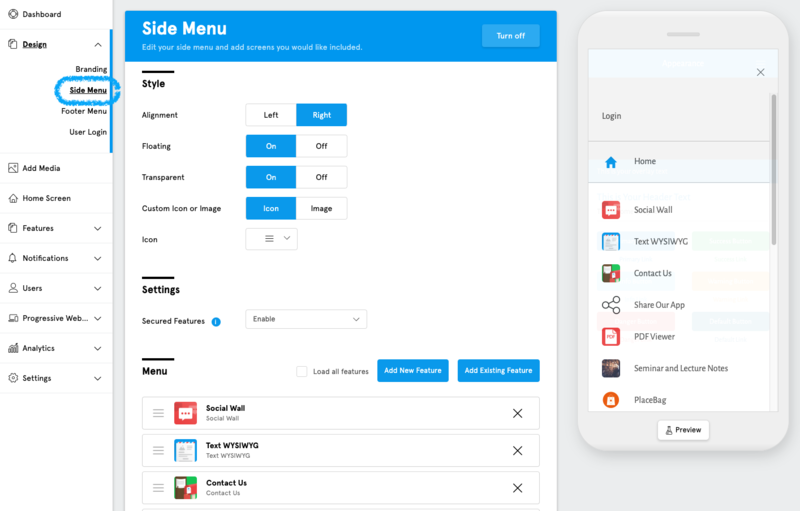 You can access the Media Library in the left side menu of the App Dashboard by clicking on “Add Media” or by triggering it throughout the App Dashboard by clicking on a component that requires an image such as image carousels, list images, and background images. Upload images and use them anywhere in your app. Choose from a selection of thousands of high quality stock photos from professional photographers around the world, all ready to use and pre-licensed for both personal and commercial use. 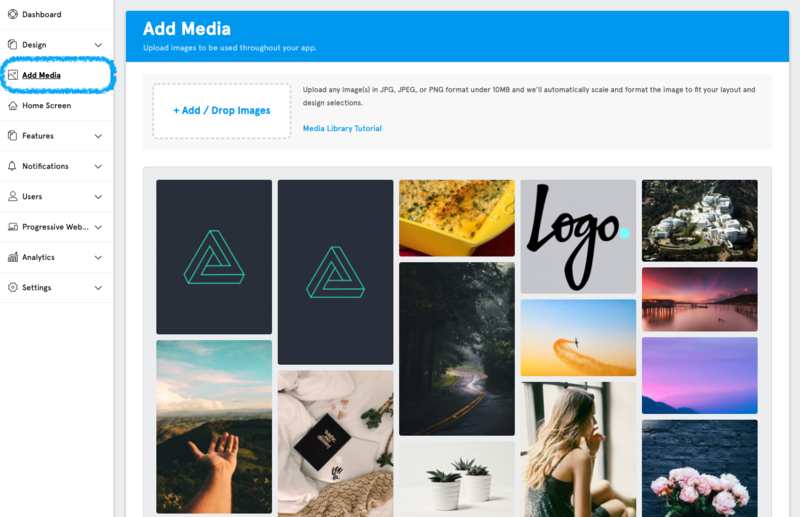 Edit your images inside the Media Library where you can add text and color enhancements, crop your images, and more! The Home Screen Feature is exactly what you’d imagine — it’s the feature that users will see when they first open your app. 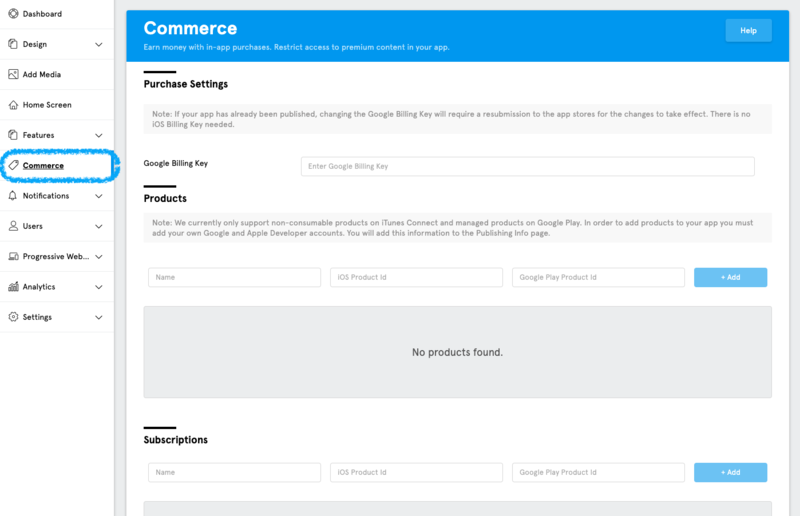 As we mentioned before, the Marketplace is where you’ll find a variety of features you can add to your app. Developers from around the world (including you) are able to submit and sell features through the marketplace, thus creating an ecosystem of solutions and possibilities. To access the Marketplace, simply click on Features -> Marketplace. 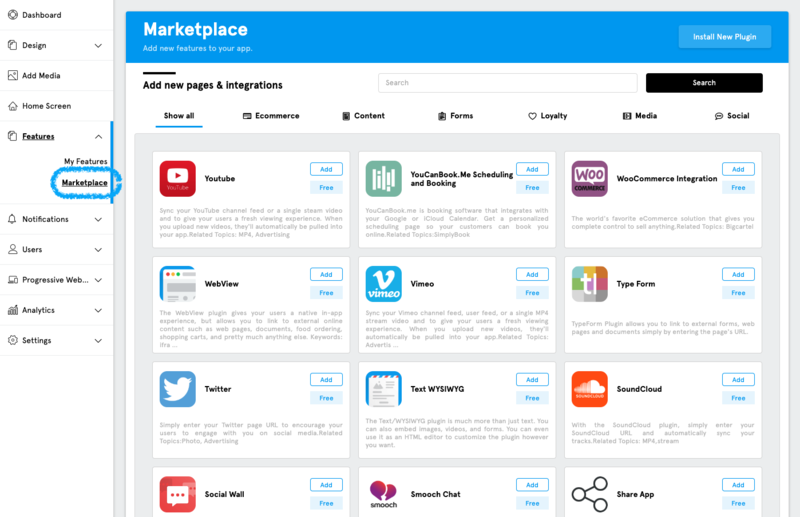 As we mentioned in our last lesson, the vast majority of Marketplace features allow you to create multiple instances. So, for example, if you have more than one calendar, you can create multiple Event instances. If you have multiple music albums or lecture collections, you can create multiple instances of the Media Center Manual feature. Or if you have different categories for your blog, you can create multiple instances of the Media Center RSS feature. We think you get the idea. You can then make these features accessible by either adding them to a folder feature, the side menu, or the footer menu. The next set of core features are advanced features that take your app to the next level by making it more engaging and giving you more control. In order to unlock them, simply click upgrade at the top of the app dashboard and choose whichever plan works best for you. Note: some of these features require your app to be live in the app stores in order to function. This is where you can set up In App Purchases, which will enable you to increase your revenue by selling exclusive content to your users. Push Notifications are an amazing way to communicate instantly to your audience. 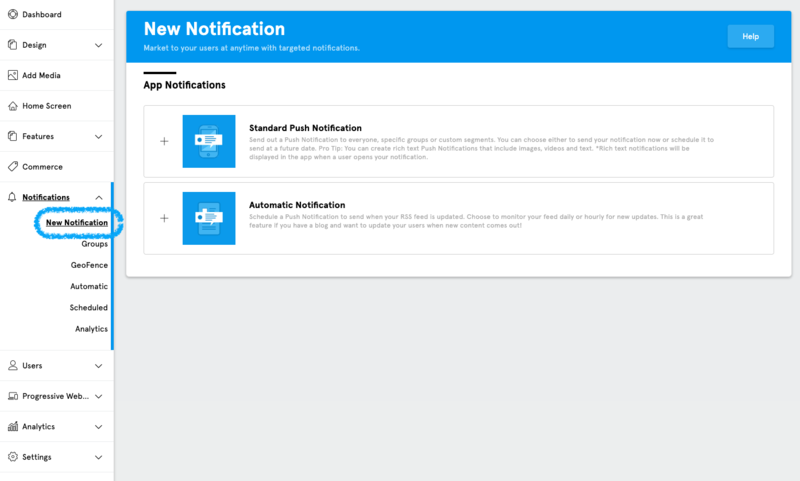 With our Push Notifications, you’ll be able to send your message to the right people at the right time. You can create groups (or channels) to which users can subscribe. For example, if you’re building an app for your school, you can set up a group for each grade which will allow you to send grade-specific notifications. Or you can select an individual person or a targeted segment of people based on custom parameters. For example, you can send a message to just your VIP members, or to your staff. User tagging is a great way tool that can help you perform some advanced, engaging actions. With it, for example, you can send target push notifications and, with the security settings, restrict certain parts of your app to specific users. It’s also a great way to get to know your users. For example, you can automatically tag users when they enter specific features. You can then see how many times they’ve accessed that feature. 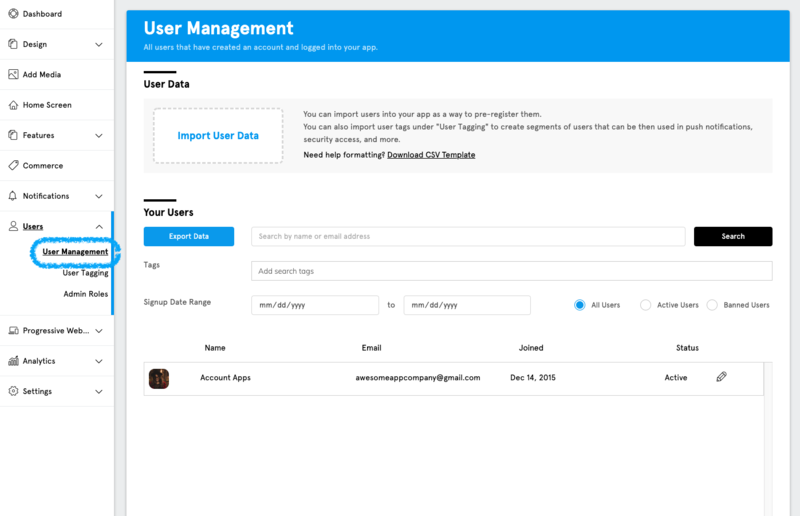 We’ve created a dedicated User Tagging and Management tutorial here. Analytics give you wonderful informational insight on an app-level such as how many downloads and registered users you have, and also lets you measure your push notification effectiveness. 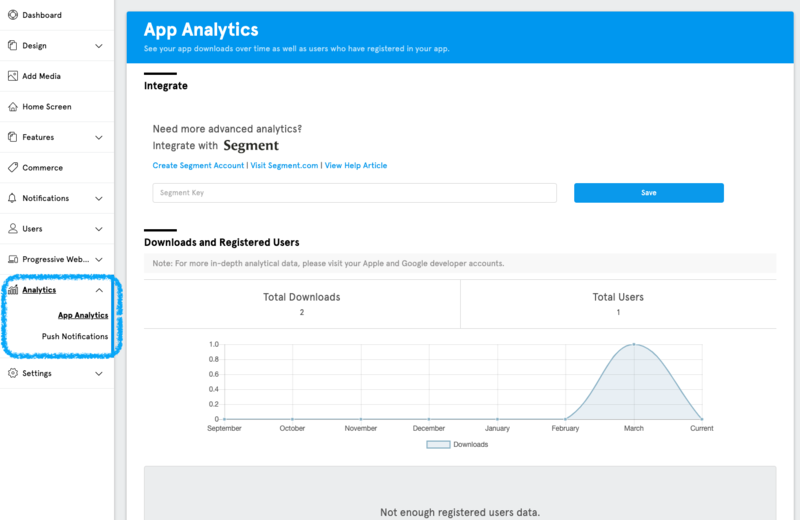 With Segment integration, you can take it a step further to see where your users are spending their time in your app, how many sessions they’re engaging in, and more. Now that you know what the core features are, in the next lesson we’ll talk about the common standardized components you’ll find throughout the App Dashboard when you’re building your app that will help to streamline your experience.